What Type of Work Do We Offer? Friendly, experienced technicians make the Dickow Cyzak team a strong crew of flooring experts. The standard of workmanship maintained has established a widely known reputation for outstanding service and quality. Based in Southern Wisconsin, we cater to commercial clients throughout both Southeastern Wisconsin and Northern Illinois. 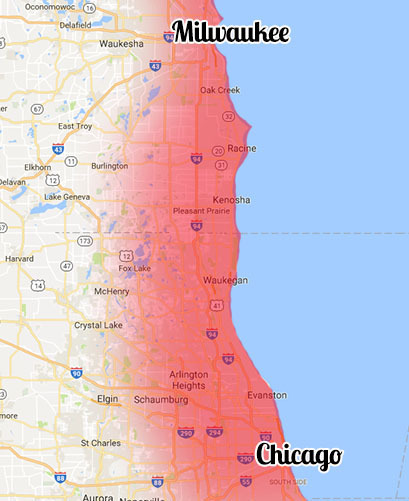 Our warehouse is conveniently located 65 miles north of Chicago & 35 miles south of Milwaukee. Give us a call today at (262) 694-9777 to set up a meeting! What Kinds of Jobs Do We Handle? With over 50 years experience, we are fully capable of completing both small and large jobs of all kinds, be it a total revamp or repair. Our dependent, efficient crew is quick, precise, and passionate about achieving complete customer satisfaction with every project for every client. Feel free to contact us at (262) 694-9777 to update your commercial space! Copyright © Dickow Cyzak Tile Company. All Rights Reserved.